At the STAG 2014 World Veteran Championships in the New Zealand city of Auckland after a rest day yesterday, players are back for another day of competition. Austria’s DING Yi beat Germanys Robert MULLER 3 -0 (11-2, 11-2, 11-4) to advance to the next round in the men’s singles 50 – 59. 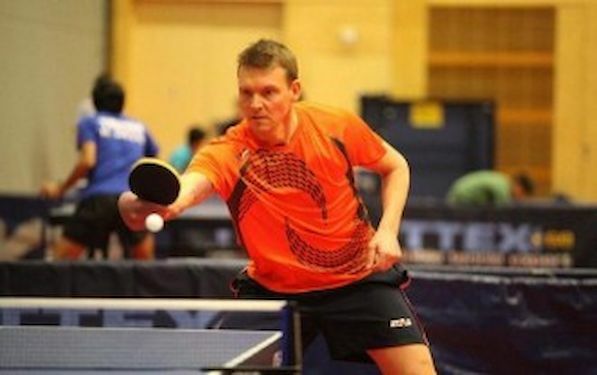 Germany’s Jaroslav KUNZ plays Lubomir Valek from Slovakia in the men’s 65 – 70 section. The tournaments oldest male player, 93-year-old New Zealander, Harry TAYLOR will also play later this evening against Charles Usher from England. Over 40’s competitor Peter KARLSSON, of Sweden, eased his way into his evening match. The first round was neck and neck. However, the second and third was played superbly by KARLSSON, who predominantly performed with a strong forehand. With an aura of certainty about him, he explained that he is “loving the relaxed atmosphere” the arena delivers. Final scoring for KARLSSON’S game consisted of an 11-9 win in the first round, 10-4 win in the second and an 11-6 win in the third. KARLSSON is next due to play Seref BAKANAY from Australia this evening (Thursday 15th) at 20:30, on table 17, so jump online to watch Live Feed http://static.viewer.dacast.com/b/19938/c/45475. Monika KNEIP, although in the 60-64 category, has been throwing herself around the arena. All the way from Germany and with a previous win in 2012, for the same category, she is someone to keep an eye on.